Making Plantain Pancakes is another way to use up overripe (black)plantains, but you can also make use of the ripe (yellow) ones too. Plantains are rich in minerals(potasium, magnesium, iron, phosphorous), Vitamins(A, B6 and C) and fiber and taste really good. Plantain pancakes are simply delicious and I’m sure you’ll enjoy them too. To get a smooth consistency, you can puree in a blender or mix the mashed plantains thoroughly with a little water, pass it through a tight sieve and mash any lumpy plantains with a spoon. *Break the eggs into a wide bowl,add the milk,sugar and mashed or blended plantains, mix together using a whisk or a fork. * Add the grated nutmeg(optional), the minced onions, pepper and salt. * Gradually sift in the baking soda and flour and keep on whisking. The mixture would begin to thicken and look lumpy. * Add the water and continue stirring until the pancake batter is smooth with a runny consistency, but not too watery. Leave the batter to rest for 15 minutes. Tip: Note that the lighter you make the batter, the thinner the pancakes will turn out. * Pour a little oil on a pan, enough to grease the pan; spread the oil with a brush to grease the whole surface and heat up until hot. Tip: A non-stick pan is highly recommended for this. * Using a ladle(soup spoon), scoop up some of the pancake batter and pour into the hot pan. Gently tilt the pan, so that the batter can evenly coat the surface of the pan. * Cook one side of the Pancake (on low heat) for a few seconds; as you begin to see air bubbles and the sides of the pancake turning dark;flip over and cook the other side. Repeat this process for the remaining pancake batter. Always grease the pan before use. Tip : You can also puree all the ingredients in a blender and cook as written above. Plantain Pancake can be enjoyed as a snack with a chilled drink or as a breakfast/dinner meal with a cool/hot beverage. Here’s are other plantain recipes you might like. 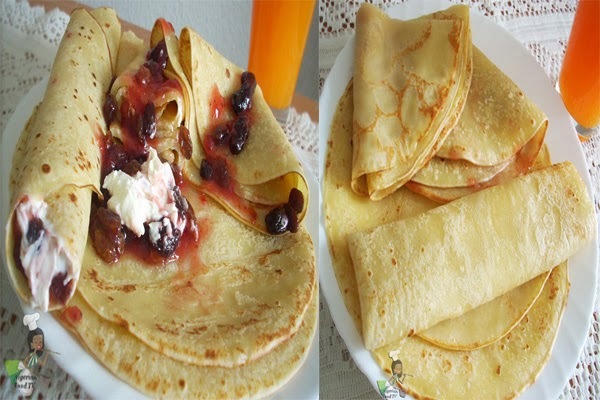 and this is our Nigerian Pancake recipe and Banana Pancake…looks yummy, right? Wow! i tried the plantain pancake today and it was very fine……….i and my wife were competing for the next fry..Thanks for the good job. Hi,Thanks for sharing this, trued thus but the pancake was sticky on the pan like it hadn't risen (or so), what could be the possible reason?? Wow, finally. Av being wanting to see ao dis plantain pancake is made for a long tym, tanx for dis Nky, will try it dis weekend. Thumbs up. Yaaayy!! So I just tried it out NOW! and was it AWESOME?!!! So filling too. Though I added steamed ground fresh tomatoes to mine, 'cos I don't joke with those veggies. Twas real good. Washed it down with chilled 7up…hehehe. Wish I could post a photo. Thank you ma, your recipes are reporting here!! Hello is it hot,cold or warm water u add pls,? Wow. Nice one. Will definitely try this 2mrw. Well done. Is this the same thing as flat Mosa? Or is there a different recipie for it?? I tried it yesterday and it was soo good, pls keep up the good work. usually dont do much cooking, more like once in a month,but ever since i found this site i'v been on a cooking spree. your step by step guides are amazing,its become the highlight of my week, please keep it up, tnx a lot for making me love the kitchen….. Thanks for your lovely feedback dearie.I'm so glad to be of help and do keep me updated on your cooking. Hug received :)Good to have you here. Hi Nky, trying this now and its not turning out well. I followed all the steps above. Wat do I do to d remaining batter! Hi dearie if you followed the recipe ''as it is'' you are not supposed to have problems, pls go over it and find out where you went wrong. Sometimes it could be the pan that makes it not hold together. I have one of those pans that I don't use for pancake frying at all! For the best results, use a non-stick pan. thanks for helping out Hannah, that might also be the reason. I also tried the recipe eventually, and they were scrumptious! My only issue was with the colour of my pancakes being more of a brown-brown, and not a golden brown like in the pictures here. Now I want to try them again, and I think I'll blend the plantains this time for a smoother consistency. Hi dearie, I am glad you enjoyed the recipe. I think mine came out lighter because I used a mixture of ripe and unripe plantains. And yes, using a blender yields a smoother batter. I don't know how I got to this blog, but I must confess I'm in love with your posts already. I'm going to try this plantain pancake today. Good to have you here, hope you stick around and I'll be expecting a feedback. Nice one here. Tank u.
Wow! I tried it out today and it was nice! Got my brothers waiting on the pan for the next pancake to fry! They normally are very pessimistic about tryn out new foods esp if its nw a seemingly odd combo ( e.g plantain + pancake) Ah!!! They wont even taste it! So i locked them out of the kitchen! Told them its cos i'm adding a secret ingredient. I did all thw mashing and blending and quickly cleaned up all traces of plantain… After tasting the first pancake, i had them guessing… Surely they could never guess right. I revealed my secret ingredient nd it was a welcome innovation!! Thanks Nky! I love pancakes! Expect my feedback soon. Nice and yummy! Will sure try it. God bless you Nky! Good job. God bless you for this cooking tips. I just made Ogbono soup for the first time using your directions. plantain pancakes? this looks delicious. thank sis, you are the best. wow, Nky, first it was banana puff puff , now you have come with this one. I am sure going to try it because i love plantain and can eat it all day , just like you, thanks and keep them coming. I just stumbled upon this site. I love every bit of it. The pancakes looks lovely and didn't know one can mix plantain with a pancake batter. Will try it out this weekend. Thanks a bunch. Thanks for your lovely comment Hun, good to have you here . I ll be expecting your feedback.